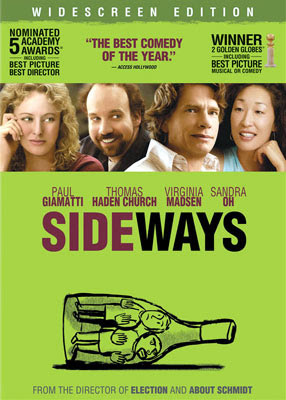 Do you remember the movie Sideways? It came out in 2004, so it's sort of old, but anyway, it's about two guys who head to California's wine country in the Santa Ynez Valley for a week for a bachelor party before one of the guys gets married. The reason why I'm asking is because I just jet setted there and I have to say it is an awesome place! I have been to Napa Valley before and it is gorgeous and worth checking out, but Santa Ynez is a lot less commercial and has so much natural beauty...plus some pretty awesome wine too I might add! If you are ever on the west coast near L.A., then I definitely say you MUST go to Santa Ynez Wine Country. I will have more about this amazing place in the next couple of days...so stay tuned. In the meantime, if you haven't seen the movie, then I suggest renting it, and even if you have seen it, watch it again, because you'll know exactly what I'm talking about in my posts! I love that movie! I thought it took place in Napa Valley...not Santa Ynez. Wow, now I want to go to SI and not Napa.